Six years after Apple pioneered what it means to be a mobile app, the company has reinvented the concept in iOS 8. Thanks to what the company calls Extensibility, iOS 8 can let apps talk to one another and work together like never before. Once developers figure out how to implement their newfound flexibility, apps won’t just be apps anymore. They will become tools and services. Not just silos that can’t communicate, but pipes feeding into each other. “Extensibility is tremendously interesting, and it’s fair to say developers have hoped for something like this practically since day one,” said David Chariter of AgileBits, makers of 1Password. Developers like AgileBits see iOS 8 as a sign that mobile apps will become not only smarter, but more powerful in their ability to aid users. 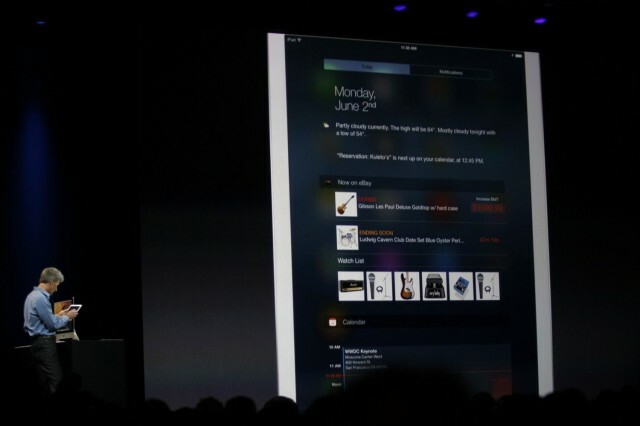 Demoed onstage at WWDC earlier this week, Extensibility is Apple’s long-awaited answer to the need for inter-app communication on iOS. Apps have traditionally been walled off from tieing into each other and Apple’s system features. The company has posited this approach as a security feature, since third-party apps are sandboxed from reaching into parts of the OS they don’t belong. Now Apple has changed its tone, and iOS is more open than ever before. Developers don’t have carte blanche to make their apps do whatever they want, but apps can work together and with Apple’s own apps in ways that were previously impossible. Extensions of apps can tie into aspects of iOS like Notication Center and the keyboard, while some will even be able to work in tandem with OS X Yosemite. In the case of 1Password, it’s easy to see how the app might be able to autofill login data in apps like Safari without needing to copy and paste between apps. The ease with which actions like this can be completed on the Mac (1Password has a browser extension for autofilling logins) will start making its way to iOS in the months to come. 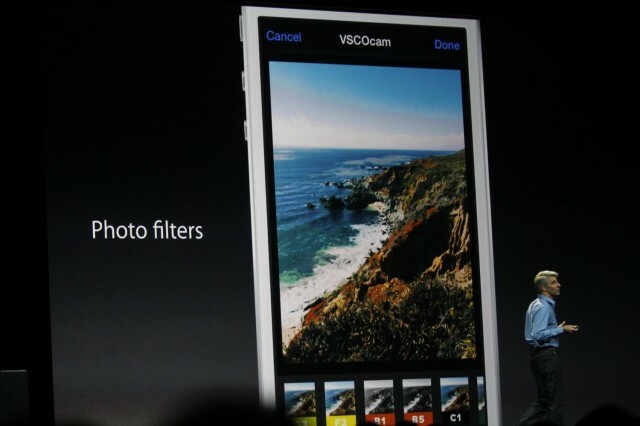 During the WWDC keynote Monday, Apple’s Craig Federighi demoed how you could use VSCO Cam’s filter presets inside the iOS 8 Camera app thanks to Extensibility. Another example shown was using the Bing app to translate a chunk of text in Safari into another language right on the webpage. Apps will need to be downloaded from the App Store for their extensions to be accessible. So, for example, you wouldn’t be able to use VSCO’s filters without the app installed. In iOS 8 you will “start to see apps as service providers,” said Rachit Shukla, the CEO of a company called Two Toasters that makes apps for brands like Airbnb and Lexus. Storage-centric companies like Dropbox and Box will beneift greatly from Extensibility, according to Shukla. Instead of needing to open the Dropbox app to upload a photo from your Camera Roll, you could just send the photo to Dropbox inside Apple’s Photos app. 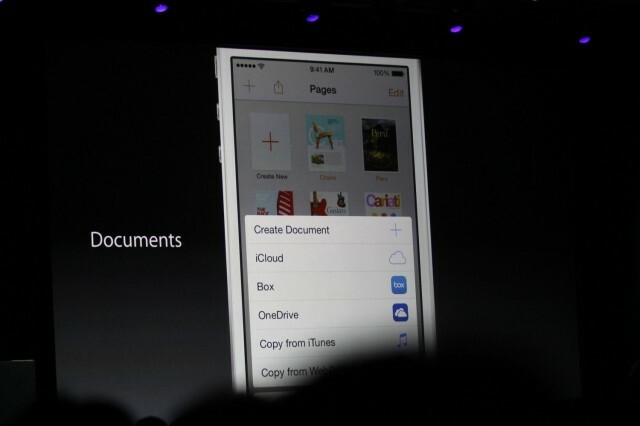 Workflows that have previously been painful in iOS will start to feel a lot like they do on the desktop. You won’t need to save a document in three different places to get it through two different editors and into your favorite cloud storage app. “With Extensibility in iOS 8, we’re excited to bring our users more options and the ability to seamlessly access all of their Box files right from within their favorite apps, eliminating the need to create additional copies,” said Box co-founder and CEO Aaron Levie in a statement. There are also big implications for e-commerce. Imagine being able to pay using your bank app credentials in Airbnb. Since Apple now lets developers use Touch ID to authenticate their apps, the friction of processing transactions could be reduced greatly. 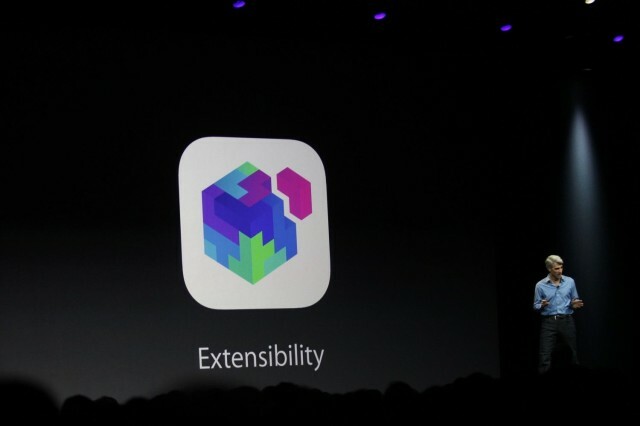 Extensibility will manifest itself in different ways as developers update their apps during the next few months. Apple finally allows third-party keyboards, and companines like Flesky are already testing their keyboard layouts on the iOS 8 beta. 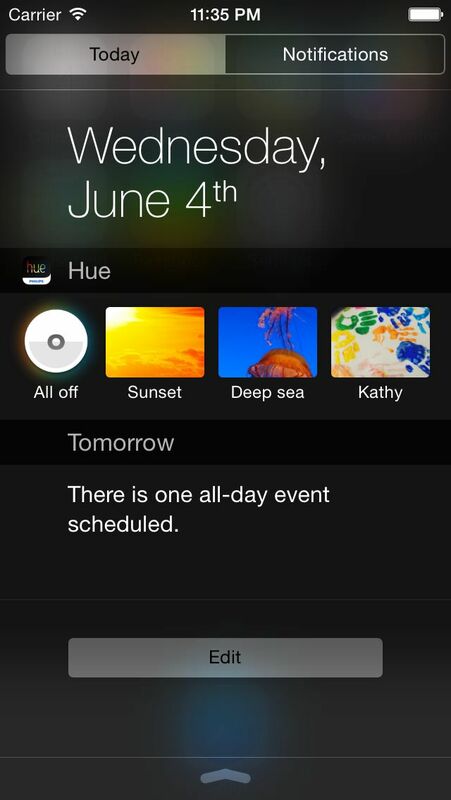 Philips has also previewed a widget in Notification Center that will allow customers to control their Hue lights. With iOS 8, Apple has made sure that its mobile devices will continue to lead the post-PC revolution. Apps are going to start growing up, and that’s a very good thing for the future of iOS.